Gosh, I’m impressed. I’ve had a few really lousy Dongbei (or Northeastern) suppers in London, and until last night had never had a good one. But a friend and I decided to visit Manchurian Legends, a Chinatown newcomer that has won some enthusiastic reviews, and for once it did live up to the hype. We began with homemade ‘mixed chilled vegetable salad’ (家常涼菜), an elegant mix of tofu skin, beanthread noodles, carrot, cucumber, spring onion and coriander, deftly seasoned with chilli oil, vinegar and lashings of garlic; and a couple of perky little fried pastries stuffed with scrambled egg and Chinese chives (韭菜盒子). The potful of sweet potato ‘glass’ noodles with sliced belly pork and pickled mustard greens that followed (酸菜五花肉燉粉條) was delightfully soft and slithery in the mouth, soothing and refreshing at the same time, and we enjoyed another local speciality, thick, lazy ribbons of mung bean pasta on a bed of slivered vegetables, adorned with intensely-flavoured pork strips, chilli and vinegar (東北大拉皮). We also ordered the Three Delicacies of the Earth ( 地三鮮, translated here as ‘sea spiced three vegetables’). Whenever I’ve had this dish before, it’s been greasy, heavy and unappetising: here, the aubergines, potatoes and peppers in a soy-dark sauce were certainly rich, but delicious with plain white rice. 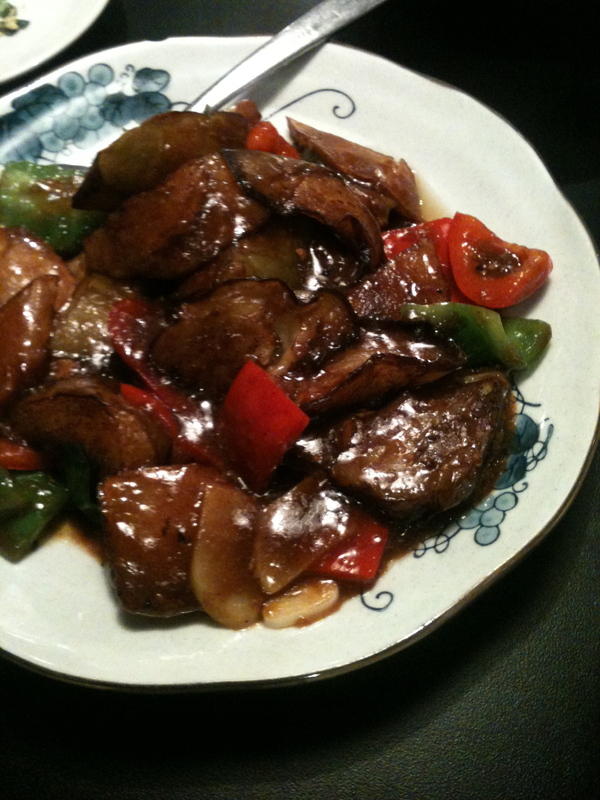 The undisputed piece de resistance, however, was the ‘Deep-fried pork in sweet and sour sauce’ (鍋包肉). Forget all those sickly-sweet, bright red sweet-sours you may have tasted in other Chinese restaurants, this was glorious: large, very thin slices of pork that had been lightly coated in batter and deep-fried to a perfect crispness, before being tossed with some slivered vegetables in a sophisticated, well-balanced sauce. Whoever was in the kitchen last night (presumably head chef Feng Yanshuang) was on top form, and fully in command of his fire (火候) and his flavours (調味). The place, which is run by the folk behind the Leong’s Legends chain, is nice too, with its bookshelves and old black-and-white photographs of Manchuria on the walls, and we found the service good and friendly. Prices were very reasonable too: frankly, the amount of food we ordered could easily have fed three or four people with a little more rice on the side, and the bill came to £56.00, including a couple of glasses of wine. As something of a southern Chinese food snob, I really didn’t expect to be so won over by a Dongbei restaurant!! I always get hungry when I read your posts or books! I must either try this place or get beck to Ba Shu as soon as possible. Thanks for this review, I would love to go and visit next time I am up in town….so reasonable too for the amount of food you ate! Oh, I’m glad you liked Manchurian Legends! I liked it too, but had been second-guessing myself after reading some of the blog posts and comments about it. Did you get the email I sent you last month? No rush for a reply if it did arrive, but I sent it via your contact form, and it’s always quite hard to tell whether those things are working or not. As a Northern Food Snob, I can only say that Dongbei has the world to offer you. I’ve tried this twice thanks to your review. Just yum! Well Mr Ritson, as you can see my eyes have been opened! Any recommendations for a good dongbei cookbook? It’d be nice to have northeastern cookbooks that I can put on my bookshelf along side your much used cookbooks!